In 1967 the very rare and lovely #3033 Beautiful Blues set was released exclusively by Sears. This magnificent set came with a twist ‘n turn Barbie doll that had long hair, with a portion pulled on up on top of her head and tied with a pretty orange hair ribbon. She had real eye-lashes, and wore a two piece vinyl orange swim-suit with a one-piece fish-net swim-suit over it. The one significant difference between this doll and all the other twist ‘n turn dolls that were released in 1967 was the striking powder blue eye shadow that Barbie wore in the Beautiful Blues Set. But, if you look closely at the picture in the Sears catalog, you will notice that the doll pictured does not show her blue eye-shadow at all, which of course was an error in printing. Barbie was available in all the same traditional hair colors as the original twist ‘n turn Barbie doll; sun kissed (light blonde), summer sand (ash blond), chocolate bon bon (dark brown), and go go co co (light brown). The set came with the doll and a stunning ensemble. The collection featured a blue sparkle one shoulder cocktail dress accented with a white satin bow with white satin trim, along with a beautiful matching blue satin coat trimmed with white fur. Completing the set were matching blue closed toe heels, and a blue clutch purse. There was a plastic ‘X’ stand and little blue hanger included as well. Rare Alert: Inland Steel Gift Set Promotion - Barbie Loves the Improvers Gift Set (1967). The set came with the #1190 Standard Straight-leg Barbie. It is the rarest gift set of them all! “Barbie Loves the Improvers” was an Inland Steel Gift Set promotion, which was extremely limited. There are only a few that have ever been found. Barbie wore a pink two-piece swim suit and had a pink ribbon tied in her hair. She’s been found with blonde and red hair. 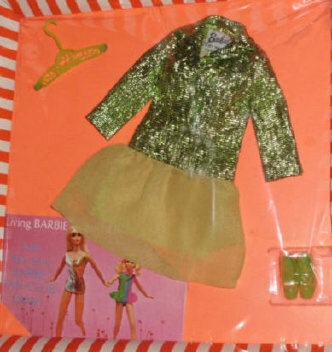 She also came with hot pink shoes and a cool metallic silver cardboard dress that looks like a tin can, that has a cut-out for her belly button (which she doesn't have!). Also, there was a flier showing an actual model wearing the “Warrior Women” tin can dress. All of this was packaged in a brown mailing box marked “Barbie Loves the Improvers”. There isn’t a lot of information about this very limited edition doll. It is believed that it was never released to the public and it was available for Inland Steel’s larger clients since there are so few ever found. I read somewhere that Inland Steel also thought of themselves as “The Improvers” at the time. It’s a known fact that there are only a few of these special dolls in existence, and having one in your collection is like finding the Holy Grail!